In some neighborhoods around Cleveland, fresh, healthy foods are getting easier to find where they weren’t before. Several of our partner neighborhood stores have started offering fruits, vegetables, cereals, whole grains, low fat dairy products and fresh meats. Some are also offering healthy prepared snacks and meals so we can stay healthy even when we are on the go. See a list of our healthy neighborhood store partners below. Good Food Here is a statewide initiative led by the Creating Healthy Communities program at the Ohio Department of Health to help make healthy foods affordable and accessible at corner and convenience stores. Local health departments across Ohio are working with small retail stores to implement Good Food Here in over a dozen cities and counties. Click here to learn more. Community residents like you have been involved in all aspects of this progam. From finding stores to partner with, suggesting healthy foods to stock, being featured in local advertisements, helping with customer surveys, residents are at the core of making Good Food Here a success. Looking for tips on healthy eating? *This is not a complete list of healthy food retailers in the Cleveland area. The stores listed above are partners with the HIP-Cuyahoga Good Food Here Program. Are you a small retailer wanting to be part of the Good Food Here network? 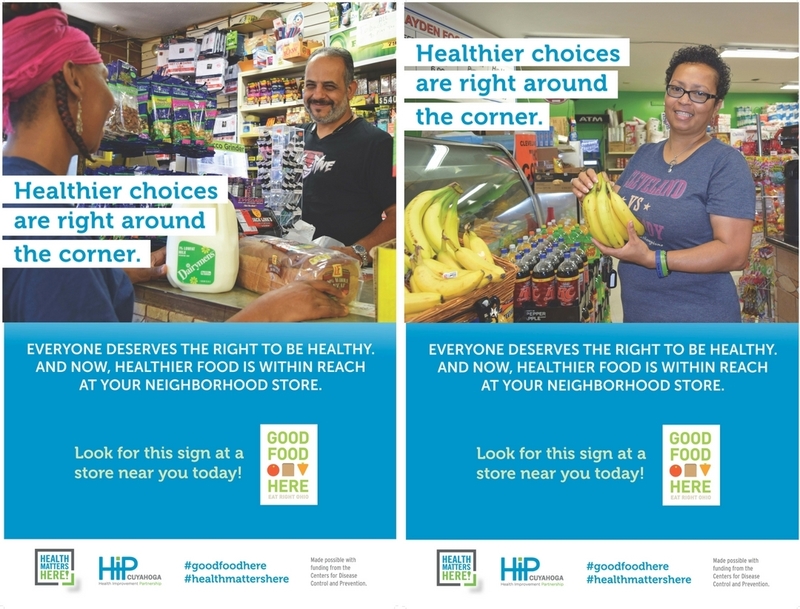 Community health ambassadors were featured in posters to promote the Good Food Here program in local health care facilities, recreation centers, barber shops, salons, CMHA housing facilities and offices throughout Cuyahoga County. This advertisement for the Good Food Here program was posted on the sides of RTA buses running throughout the east side of Cleveland in the summer of 2016. The Healthy Food Retail program is an initiative of the Healthy Eating Active Living (HEAL) Subcommittee. We are working with partners throughout the county to create healthy eating opportunities for all in Cuyahoga County. Watch this 10 minute video to learn more.